Handbook of Survival Analysis presents modern techniques and research problems in lifetime data analysis. This area of statistics deals with time-to-event data that is complicated by censoring and the dynamic nature of events occurring in time. John P. Klein is a professor and director of the Division of Biostatistics at the Medical College of Wisconsin. An elected member of the International Statistical Institute (ISI) and a fellow of the American Statistical Association (ASA), Dr. Klein is the author of 230 research papers, a co-author of Survival Analysis: Techniques for Censored and Truncated Data, an associate editor of Biometrics, Life Time Data Analysis, Dysphagia, and the Iranian Journal of Statistics. He received a Ph.D. from the University of Missouri. Hans C. van Houwelingen retired from Leiden University Medical Center in 2009 and was appointed Knight in the Order of the Dutch Lion. Dr. van Houwelingen is an elected member of the ISI, a fellow of the ASA, and an honorary member of the International Society for Clinical Biostatistics, Dutch Statistical Society, and the Dutch Region of the International Biometric Society. He is also the co-author of Dynamic Prediction in Clinical Survival Analysis. He received a Ph.D. in mathematical statistics from the University of Utrecht. Joseph G. Ibrahim is an alumni distinguished professor of biostatistics at the University of North Carolina, Chapel Hill, where he directs the Center for Innovative Clinical Trials. An elected member of the ISI and an elected fellow of the ASA and the Institute of Mathematical Statistics, Dr. Ibrahim has published over 230 research papers and two advanced graduate-level books on Bayesian survival analysis and Monte Carlo methods in Bayesian computation. He received a Ph.D. in statistics from the University of Minnesota. Thomas H. Scheike is a professor in the Department of Biostatistics at the University of Copenhagen. Dr. Scheike is the co-author of Dynamic Regression Models for Survival Data and has been involved in several R packages for the biostatistical community. He received a Ph.D. in mathematical statistics from the University of California, Berkley, and a Dr. Scient from the University of Copenhagen. "The great strength of the book lies in its comprehensive treatment of both classical and novel methods, covering almost all aspects of survival analysis that biostatisticians are confronted with in everyday practice. … the text is very well organized, and both writing style and notation are remarkably homogeneous. … readers will appreciate the inclusion of real data applications in every chapter of the book. … highly recommended to both practitioners and researchers in the biostatistics field." "Anyone already familiar with analysis of survival data should own a copy of this text, as it serves as a wonderful reference for the most recent advances in the field. Advanced PhD students are particularly encouraged to purchase it, especially if they are at the stage of trying to pick a dissertation topic. The authors of the text are to be commended for completing an extremely difficult task at such a high level. … the reader will undoubtedly find tremendous value in this text for many years." "This book is a great reference tool for both researchers applying the current survival analysis methods and for statisticians developing new methodologies. … This book is an excellent collection on current survival analysis methods and can lead the audience to learn about them and discover appropriate literature. Practitioners can find easy access to many advanced survival methods through this book. There are many excellent survival analysis books published. This is by far the one with the broadest coverage for current survival analysis techniques that I have seen." 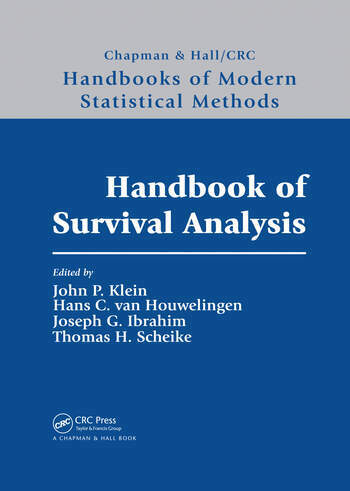 "This handbook presents methodology of modern survival analysis developed within the past thirty years including both frequentist and Bayesian techniques. The aims of the book are to provide introductory as well as more advanced material for graduate students and new researchers, to give a reference of modern survival analysis as well as to help practitioners with their survival data experiments."